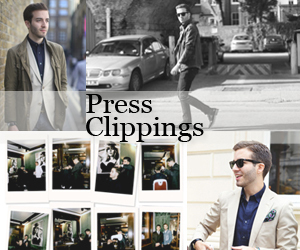 As you will notice scrolling down, it has been a great week for menswear but mostly in terms of tailoring. It's always interesting to see how different people approach it and play with the different elements that go with it. Jason Sudeikis continued to look sharp this week in a very traditional-fitting blue suit with equally traditional accessories. It was almost like a look Obama would wear but it looked better on Sudeikis. In a slim-fit grey Saint Laurent suit, James Marsden went for a more modern approach. He only used black, white and grey but the fact that he balanced the lack of tie with a waistcoat contrasting the jacket was a great move. I am always interested to see what Jamie Campbell Bower wears because he gives clothes a very personal spin. This week he did it twice. The first, a three-piece blue mohair-blend Alexander McQueen suit (buy it here: jacket, trousers, waistcoat). The second, an oxblood McQ suit worn with a shirt and pocket square in the same tones and printed detailing (buy it here: jacket, trousers). Darren Criss hosted the Teen Choice Awards last weekend and he turned up on the red carpet in a look that no teen could pull off. The deep green Emporio Armani suit was paired with a light blue shirt and deep blue tie and Christian Louboutin 'Bruno Orlato' shoes. Zachary Quinto and Chris Pine both got it right at the Japanese premiere of 'Star Trek Into Darkness'. Zachary in a light pinstripe blue suit worn with a modern striped knit tie of burgundy tones and Chris in a more daring checked suit with brown accessory notes very much on trend. The best of both looks are the perfectly cropped suit trousers. 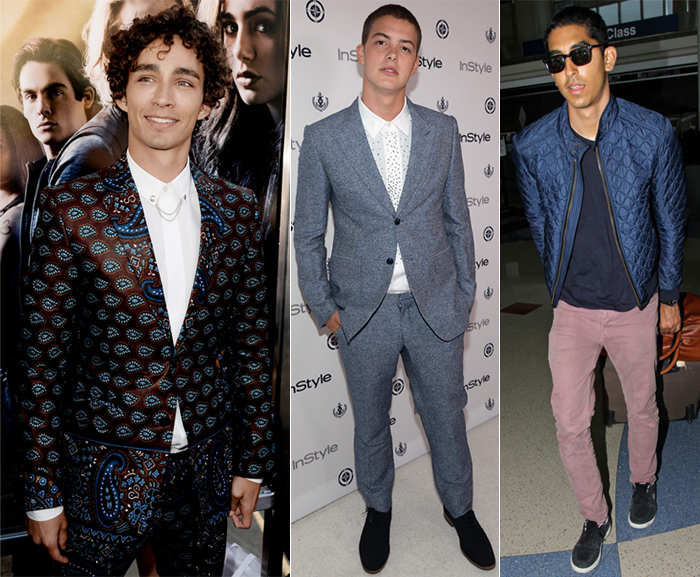 At 'The Mortal Instruments: City of Bones' premiere Robert Sheehan really put it out there with his paisley print Dent da Man suit. Just like his co-star Jamie Campbell Bower, Sheehan opted for a collar accessory rather than a tie. Don't try it at home. After trying a few different things during his 'Bling Ring' press tour, Israel Broussard has found a compromise between edgy and elegant. His Viktor & Rolf grey look brought a classic silhouette and texture to a look that was made modern by the embellished white shirt. Dev Patel brings the only casual hit of the week. The actor was seen at LAX in a pair of faded pink jeans, which he wore with a navy tee and the coolest quilted jacket.